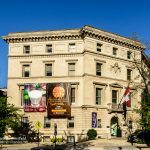 The Arts and Industries Building on the south side of The Mall in Washington, DC, is the second oldest of the Smithsonian buildings. 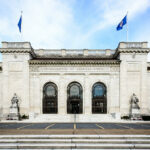 Originally called the United States National Museum, it was the first purpose built facility for public display of the Smithsonian Institution’s growing collection. It sits fifty feet south-east of the Smithsonian Building, commonly called “The Castle”. It is also located further back from the Mall so that it does not obscure the view of The Castle from the Capitol. 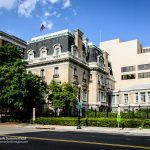 The building was constructed to house the international exhibits donated to the US Government from the Philadelphia Centennial Exhibition of 1876. It was designed to reflect the architectural style of the buildings from the Centennial Exhibition. This style was known as “world-fair” or “exposition” architecture. Most of the buildings used for exhibitions around the world beginning with the Crystal Palace Exhibition of 1851 were designed to be temporary and no longer exist. 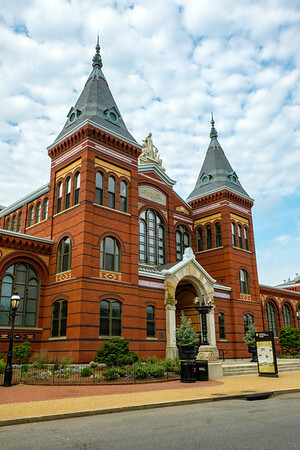 The Arts and Industries Building was always intended to be a permanent structure being part of the Smithsonian. The request for funding for the new building from the Board of Regents of the Smithsonian to Congress included a design by General Montgomery Meigs. The building was to be fireproof with concrete floors and brick walls over a steel skeleton. The final plans used for the construction were drawn up by Adolf Cluss and Paul Schulze based on the the original plan submitted by Meigs. Befitting the buildings design as a museum, it was well lit from the start. There were large windows as well as skylights and clerestory windows to provide the illumination. The addition of galleries about fifteen years after its opening, though, reduced the amount of light reaching the ground floors. 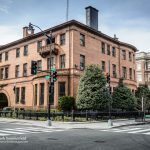 Prior to the building’s opening to the public it was used for the Inaugural Ball for President James Garfield and Vice-President Chester A Arthur on March 4, 1881. The official opening to the public occurred in November 1881. The building housed many different pieces of the Smithsonian’s vast collection. In 1910, the natural history collection was moved to the new National Museum of Natural History. At this time, the National Museum Building was renamed the Arts and Industries Building. Following a major snowstorm in Washington, DC in 2003 which caused the collapse of the roofs of two buildings of similar age, the Smithsonian did an emergency inspection of the building. Although the roof was deemed to be fairly solid, it was determined that the plumbing, electrical and mechanical systems were all beyond repair. 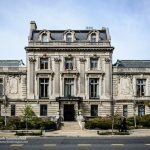 By this time, the Arts and Industries Building was used for the Smithsonian’s Archives, its Public Relations Department, a Day Care Center as well as about 500 employees. The building was only used for temporary exhibits at this time. All of this was removed and the building closed for renovation in 2004. The building reopened for special events in 2015. It has been host to numerous special events and temporary exhibits but has not reopened on a permanent basis. The Arts and Industries Building was designated as a National Historic Landmark in 1971. 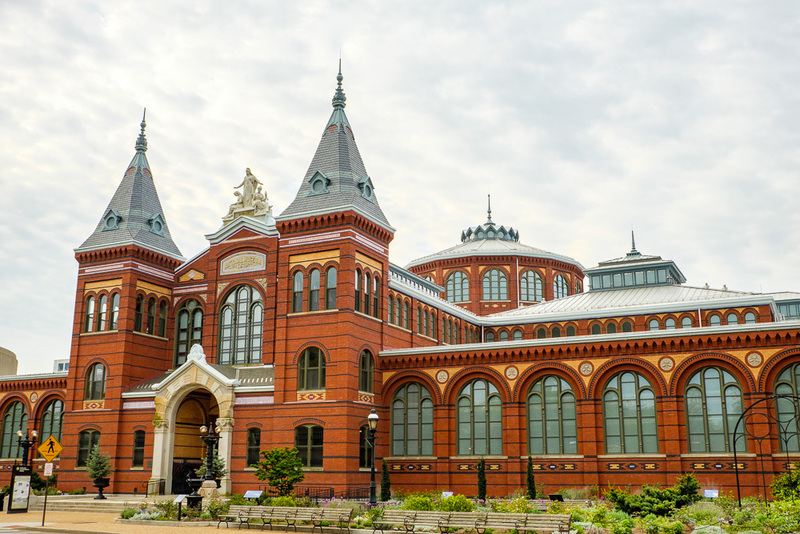 The Arts and Industries Building was opened in 1881 as the first purpose built facility for public display of the Smithsonian’s growing collection. What a nice and historical places are. I really like all these and want to see all these live.